The Wooten Neighborhood Association invites you to our next meeting on Monday, March 11 at 7 pm. All are welcome to attend – homeowners, renters, business owners, community members and potential residents. Come meet your neighbors and learn more about our community! The meeting will be held at the Redeemer Lutheran School commons area. Enter the parking lot from Lazy Lane and enter near the big WELCOME sign. Doors open at 6:30. Meeting is from 7-8pm. The February Newsletter has been printed and one thousand copies are currently making their way throughout the neighborhood. Big thanks to our advertisers, everyone who contributed to the newsletter, and to our fantastic delivery volunteered. The Newsletter is back in print! One thousand copies are currently being delivered throughout the neighborhood. Thank you to our advertisers, all those who contributed to the newsletter, and those who volunteered to deliver copies. 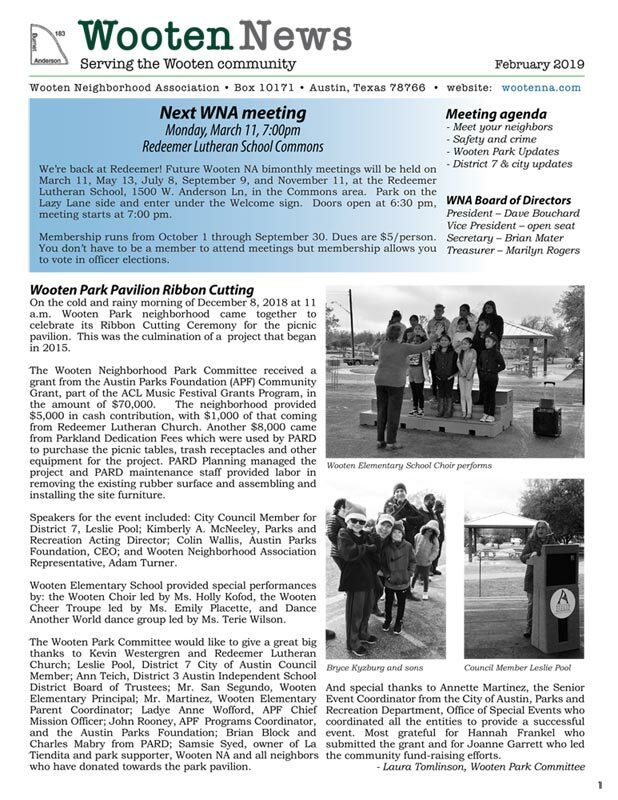 If you don’t get a printed copy of the newsletter by December and would like one, please email newsletter@wootenna.com. Motion was made to approve minutes motion was second. Motion passed. David Bouchard was nominated for the officer position of President. Motion for David Bouchard as president was made, motion was second and motion passed. Marilyn Rogers was nominated for the officer position of Treasurer. Motion for Marilyn Rogers as Treasurer was made, motion was second and motion passed. Donny Goff was nominated for the position of Secretary. Motion of Donny Goff as Secretary was made, motion was second and motion passed. No nominations for Vice-President were made. Dixie Davis will remain in the Officer position of Vice-Chair until nomination is made and approved. Treasurer report provided by Marilyn Rogers. Call for membership dues. Wooten Neighborhood Planning Contact Team (WNPCT) notice of meeting by Adam Turner. Meeting to be held on Monday July 16th at 7:00pm at Shu Shu’s. David Bouchard Adjourn the meeting. Erin Ray, a Girl Scout from Allandale, has recently completed her Gold Star project about Keeping Pathways Clear in neighborhoods. This is an important subject in Wooten, especially for our elderly and mobility impaired neighbors, as well as for anyone who wants to safely use the sidewalks. Thank you, Erin, for sharing your research with us! Read below or download the article here. Find Out How You Can Help Your Neighborhood! The Big Picture: When you go on walks in the neighborhood, have you ever had to step off the sidewalk because of low hanging branches? Or tripped on vegetation growing over the sidewalk or curb? Or when you’re driving in the neighborhood, have you ever had to pull into the cross street to look for oncoming traffic because of an overgrown hedge? Or accidently ran a stop sign because it was hidden from view by some overgrowth? These encounters could force someone to go into oncoming traffic when they wouldn’t have otherwise or even not be able to make full use of the sidewalk in the case of those who need wheelchairs or other mobility aids. These compound into a high potential for causing accidents, causing people to stay indoors, and causing an overall sense of discontent. Take a walk around your property and noting the plants, bushes, and trees extending into the sidewalks and/or beyond the curb (especially with these dimensions in mind: vegetation should be 8 feet above the sidewalk and 14 feet above the street). Simply prune back the areas that interfere with accessibility and/or visibility (a quick google search on pruning or asking the employees at The Natural Gardener can help immensely). If you have a good rapport with your neighbors and notice an issue, please let them know what they can do to help as well. Why You Should Help: This past year, 2018, I surveyed 70 streets and almost 1900 homes in my neighborhood of Allandale. At the start of the year, 50% had issues with vegetation blocking the right of way. Now, a year later, that number has been reduced to 35% that still have issues with overgrowth into the right of way. With these results, Allandale has become a safer, more accessible, and comfortable neighborhood! This benefited the residents and visitors to our neighborhood by making it easier for people to get out and be active by reducing vegetation that blocks the right-of-way. This, in turn, will improve physical and mental well being, increase neighbor interactions and safety, and improve the quality of our neighborhood. By maintaining the care and health of the vegetation on your property, you can double the amount of usable sidewalks, increase safety for pedestrians, cyclists, and vehicles, as well as provide shade, improve air quality, and keep your neighborhood comfortable. I wanted to share the results of Allandale’s success to motivate more people and communities to take the initiative to improve their grounds for the benefit of all. 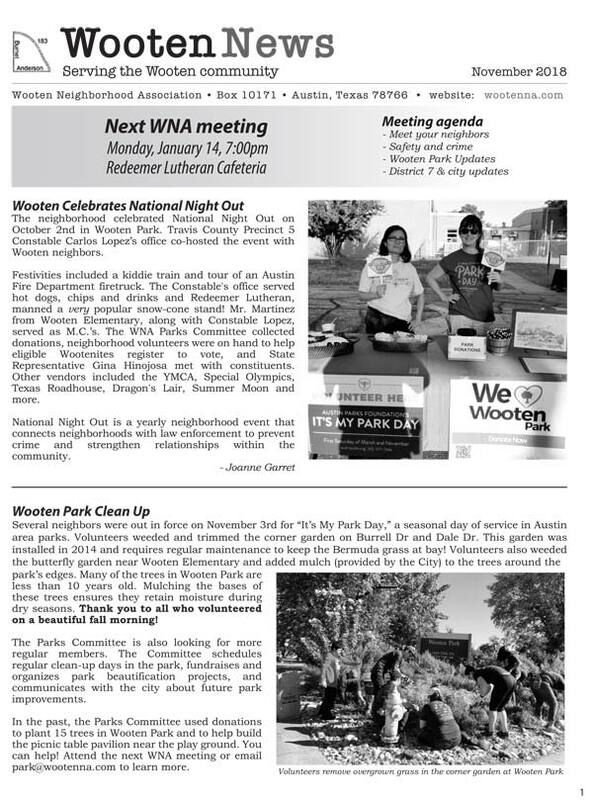 The Wooten Neighborhood Association brought the newsletter out of retirement earlier this year and now we’re back with the all-new, all-digital August edition of WOOTEN NEWS. Download today and read about park updates, volunteer opportunities, neighborhood events and more! Thank you to all the neighbors who contributed, edited, and distributed the newsletter! All are welcome to attend – homeowners, renters, business owners, community members and potential residents. Come meet your neighbors and learn more about our community! The agenda will include reports about neighborhood events, safety and crime, Wooten Park activities, and VOTING on WNA Officers. We usually hear from District 7 councilmember Leslie Pool or her staff, and our police District Representative, Officer Judson Chapman — along with lots of other news from neighbors. 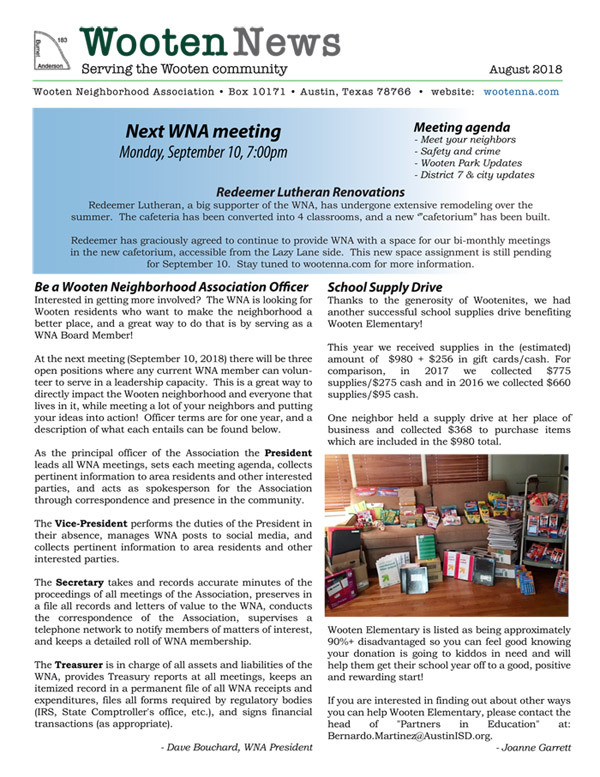 If you would like to learn more about the roles of WNA Officers, please read the first article in our August Newsletter. Official WNA Meetings are held on the second Monday of odd-numbered months at 7pm at the Redeemer Lutheran Church Commons Area. Support current Wooten Park projects!